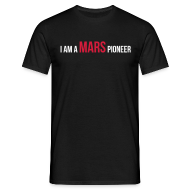 Even on a remote and rather friendly place like Mars, accidents are likely to happen. One small step and an unwary astronaut can easily tumble, breaking his arm or leg or receiving even worse damage. 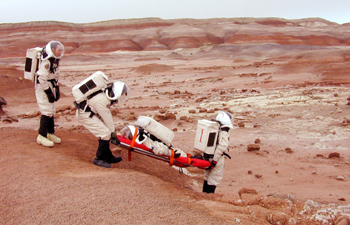 This and the procedures for first aid and safe transportation of the patient was exactly what we wanted to simulate in today’s MedMars EVA. To make the scenario as real as possible, two astronauts – EVA Team 1 with Gernot Gröemer, our Health and Safety Officer, acting as EVA Commander, and Alexander Soucek, the First Officer, went onto a geological sample excursion (dubbed “GeoMars”) in the close vicinity of the Habitat. Something like 400 m away in easterly direction, EVA team 1 obtained the first geological sample. After a careful sealing for later processing, the team moved on and then – the simulated – disaster struck: Alexander slipped and fell unluckily against a stone, presumably breaking his right ankle joint. Gernot came quickly to his rescue. Realising that Alexander had (simulated) pain and could not stand up any more, Gernot contacted HabCom, which was at that time myself, supported by Christoph Kandler, the AustroMars Mission Specialist for planetary Sciences. After careful consulting, the HSO declared a level 3 emergency, asking for a 2 men rescue team (EVA Team 2) to come to the accident site as quickly as possible for support. We informed MCC Salzburg and ordered Christian Hutsteiner, the Flight Engineer, as well as Markus Spiss, our Mission Specialist for Life Sciences, to don their space suits as fast as possible to come to their help. In the record time of approximately 20 minutes, EVA Team 2 had finished donning their suits and stepped into the airlock. In the meantime, Gernot had stabilised Alexander, who was lying unpleasantly on a little hill and has given him some medicaments (simulated) to ease the pain and stabilise the blood pressure. 10 minutes later, EVA Team 2 was on its way, taking with them a splint and a camera to monitor all the steps of the first aid procedure for the medical doctors in Austria. Alexander did his best to simulate an injured patient. Every time he started to whine it felt not at all as a simulation anymore and then both Christoph and I, monitoring and co-coordinating the rescue mission from inside the Habitat, hoped that the rescue EVA team would start to run to reach them faster. As human as this is, it is of course of no good as no one would want to risk the health of the rescue team as well. Finally EVA Team 2 had reached Alexander and Gernot and started the first aid. After stabilising his foot ankle and the transportation of the patient started. Luckily the accident had happened not so far away from the MDRS, so the transport took only but a few minutes. Still everyone said afterwards that it required a lot of effort to transport the patient and even Alex was exhausted, claiming that holding fast to the spacesuits of his rescue team was everything but easy. The effort required is most likely best visible from the energy consumption of Markus. Although he was only one hour outside he burnt 729 calories. Once Alexander was inside, the simulation did not end. He was stripped of his space suit and laid back in the lab area, where Gernot and Markus applied a cast to his (simulated) broken ankle joint. At the time that I write this report, Alexander is still wearing the cast to see how much he is immobilised. All that was photographed and videotaped to be later studied in detail by several medical doctors back in Austria. And the doctors are not the only spectators, we covered the whole experiment as well for the Austrian Broadcasting Cooperation, which will most likely include it in their AustroMars documentary. In general this experiment had worked very well. The minor flaw that the camera had not worked properly at the first instance was quickly recovered by doing a second bandaging simulation at a closer distance to the MDRS. The positive side effect of this was that the procedure was done a second time, proving its worth then as well.